The Mitsubishi Carisma 1.8 GDI (Gasoline Direct Injection, so not a diesel engine as you might think) is new in the championship this year. There a two factory entered cars for Allard Kalff and Sandra van der Sloot. All Carismas are built in the former DAF car factory in Eindhoven, the Netherlands, and the factory tries to improve the dull image of the cars by taking part in races and rallyes. The racing Carismas are lacking power and reliability and can't really threaten the BMW's and Renaults. Even the services of well-experienced driver Allard Kalff (a former European Opel Lotus champion who also drives GT races in England) doesn't give them an edge. Still, the cars are improved race by race and maybe we'll see them winning next year. 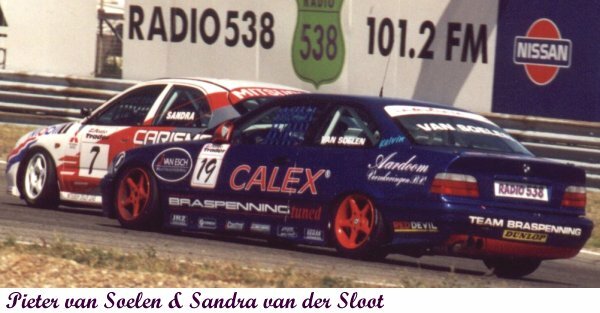 Here's Sandra van der Sloot in her Carisma battling with Pieter van Soelen in a BMW 320i Coupé run by Braspenning Racing. Sandra is the only female driver in the Dutch Touring Car Championship. She made her name racing in several one-make cups, where she often outraced her male opponents. This year however she's struggling. This is close racing by Marcel Alderden, overtaking one of the BMW's of the H&P Panorama team. Alderden drives Donald Molenaar's last years car, also entered by Donald Molenaar. A bit of bumper hugging by privateers Roelof Lantinga (VW Golf 2.0 16v) and Jaap Kielman (Opel Astra GSi). Their cars are evenly matched, but the Astra is more reliable. Therefore its higher placed in the points standing and it won the battle with the the Golf in this race. Here's Jaap's Astra again, now in dispute over a piece of tarmac with Ron Braspenning (BMW 320i Coupé). Both cars have 2-litre engines, but the one in the BMW has 6 cylinders where the Astra has 4. Therefore the power output of the BMW is higher because it can withstand a higher engine strain. But on the other hand the Astra is lighter and more nimble, so it could be in with a chance. In this race Ron Braspenning and most other BMW's proved to be faster, probably because they're higher developed. Ron Braspenning is a well-known garage keeper in the Amsterdam area and runs his own racing team with no less than 5 BMW's entered in this race. The race was nice to look at, but not that spectacular. Sandor van Es took the lead very early in the race and kept it ever since. Standing next to the track watching, it was interesting to notice the cars deteriorating during the race. The tire and engine wear is worse than you might have expected, and underbraking and sliding cars were common at the end of the race. This is probably an effect of the almost standard production car engineering of the cars, which doesn't allow much parts to be up to racing demands. Breaks and gearbox are the weak spots in these cars, and successful racing in this class is not really about being the fastest driver. You can only be successful if you can get the maximum speed from your car the longest time, and that takes more strategy and engineering skills than driving skills. Because of the low interest of Dutch car dealers in racing, this class is no match at all for the touring car championships in England, Germany and many other European countries. It needs desperately to have more different and competitive cars in it to get more general attention and survive. 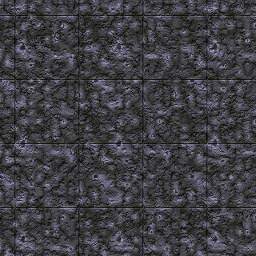 In the current state it's more clubracing than anything else.